I’m continually surprised by the great games that are being released for the iPhone. I thought I’d do some quick reviews of two that I feel have made real innovative enhancements to the match-3 genre of puzzle games. This is a game I downloaded only just today. I noticed it because it just changed to free, and I’ve been watching the apps that come down in price regularly over at 148 Apps. But enough about how I discovered it. It adds several new game mechanics to the match-3 paradigm. Most notable, in my opinion, is the ability to merge pieces that are different colors to form a new color. This can only be done with the yellow, blue and red pieces, to form any of the other three colors, green, orange or purple. It’s a brilliant addition, and really does make you think quite a bit about the additional possibilities. There are at least two different shapes of piece, circles and squares. The game is played in a series of levels, and each one has a different objective, for example, an objective might be something like “5 Orange Sequences of 3 or more (blocks only)”. Each level is a sort of mini-match-3 game, some with infinite pieces (like bejeweled), and some where you just make matches until the pieces run out. At free, this game is well worth a download. In contrast, I discovered Gem Spinner over a month ago. This game is thematically a lot more like bejeweled (obviously, there are gems in it), but the big innovation here is that the board is divided up into areas, and double clicking on a piece in one of those areas causes all the gems in that area to rotate 180 degrees in relation to one another. Gems can only be swapped to match 3 within an area, they cannot cross over into other areas. Also, each square in an area will change color slightly once a match has been made in it. 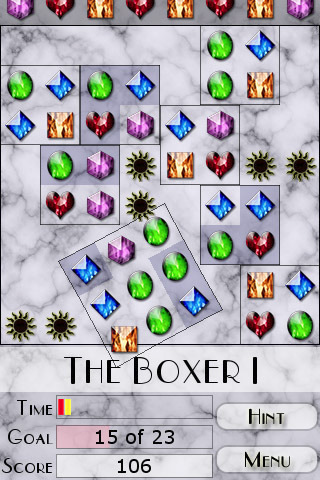 This is a lot like another popular match-3 franchise, Jewel Quest, only in this game, when a whole area of gems has changed color, it is removed from the game, and you can then drag and drop the remaining areas all over the game board. It felt overly complicated for all of about two minutes, but it didn’t take long for it to really become intuitive, and the added complexity makes for some really brain-burning puzzle game fun. In conclusion, neither of these games are probably going to “hit it big” with the masses. They both suffer from pretty mediocre graphics and are probably a little too complicated for the average (read “beginner”) casual gamer. I guess what I mean is that you have to already be familiar with match-3 games before you can start to wrap your head around the concepts in these games. But it’s precisely this additional complexity and added strategy that has, against all odds, gotten me excited about a match-3 game once again. 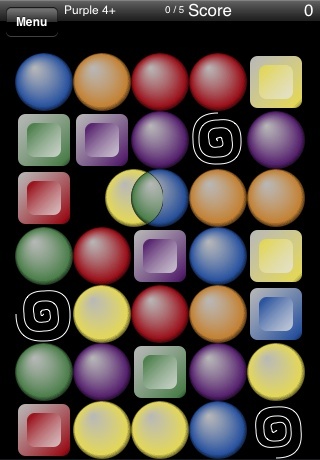 For the record, I feel I should throw a shout out to my Wife’s favorite match-3 game on the iPhone, (and probably the only one she’s ever played, ChocChocPop. There’s nothing terribly innovative about it, but it’s got a great theme (you’re matching chocolate candies), and has the best design of any simple match-3 game I’ve seen yet for the iPhone. I think it may actually be the only game she has on her phone.